 Mouse anti SLP-76 antibody, clone SLP-76/03 recognises the SH2 domain-containing leucocyte protein, also known as SLP-76 or Lymphocyte cytosolic protein 2. SLP-76 is a ~76 kDa tyrosine phosphoprotein, expressed primarily by T lymphocytes and cells of the myeloid lineage. SLP-76 is one of several adaptor proteins assisting with TCR-mediated signal transduction, through GRB2 binding, functioning as a substrate for the protein-tyrosine kinase ZAP-70 and thus playing a crucial role in both T cell ontogeny and activation. Other molecules that associate with SLP-76 include phospholipase C (PLC)–gamma, Vav, Nck and fyn binding protein. A fusion protein corresponding to amino acids 216-434 of human SLP-76. MCA2377 detects a band of approximately 76kDa in T lymphocyte cell lysates. Di Bartolo V et al. (2007) A novel pathway down-modulating T cell activation involves HPK-1-dependent recruitment of 14-3-3 proteins on SLP-76. J Exp Med. 204 (3): 681-91. Brockmeyer, C. et al. (2011) T cell receptor (TCR)-induced tyrosine phosphorylation dynamics identifies themis as a new TCR signalosome component. J Biol Chem. 286: 7535-47. Lasserre, R. et al. (2011) Release of serine/threonine-phosphorylated adaptors from signaling microclusters down-regulates T cell activation. J Cell Biol. 195 (5): 839-53. Lasserre, R. et al. (2010) Ezrin tunes T-cell activation by controlling Dlg1 and microtubule positioning at the immunological synapse. Paster, W. et al. (2013) GRB2-mediated recruitment of THEMIS to LAT is essential for thymocyte development. J Immunol. 190 (7): 3749-56. Bonilla, F.A. et al. (2000) Adapter proteins SLP-76 and BLNK both are expressed by murine macrophages and are linked to signaling via Fcgamma receptors I and II/III. Proc Natl Acad Sci U S A. 97 (4): 1725-30.